When the three captives were taken, they descended a “rung ladder” and a door opened at the bottom to the large cell. So the ladder descended aft toward the Mechanical Room, not forward toward the Dining Room. This doesn’t sound like a sufficient space for a straight staircase down two levels. 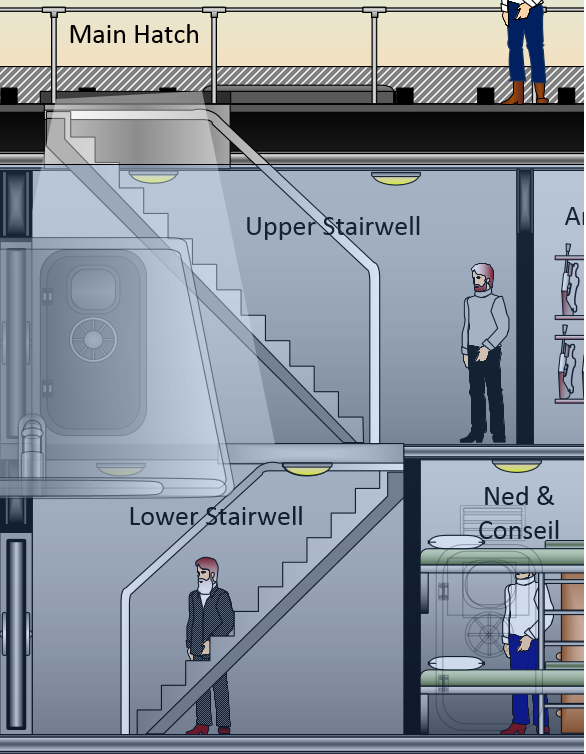 I was unable to find any submarine, old or new, where a single stairway descended two deck levels in a single stretch. Stairs and or ladders were, and are, installed one deck at a time. We soon see that the initial cell measured as 20 feet by 10, with a ceiling “higher than Ned Land can reach”, is located at the bottom of the ladder from the deck hatch. ( Later it’s defined to be the same deck level as the dining-room and some distance from the stairs.) Aronnax confirms that this room is completely empty but for the table and stools. Although the Walter James Miller translation also has Aronnax saying of their initial decent into the ship: “I felt my naked feet touching the rungs of an iron ladder.” I don’t think this was the case. The central staircase is metal and may have felt similar to some type of rung in the dark. Even the original art depicts this to be a set of stairs. Note: After much review, trial and error, I moved several rooms to the upper deck. Based on Vern’s ship dimensions and the curvature of the hull, these compartments fit well when applying the two deck principal. 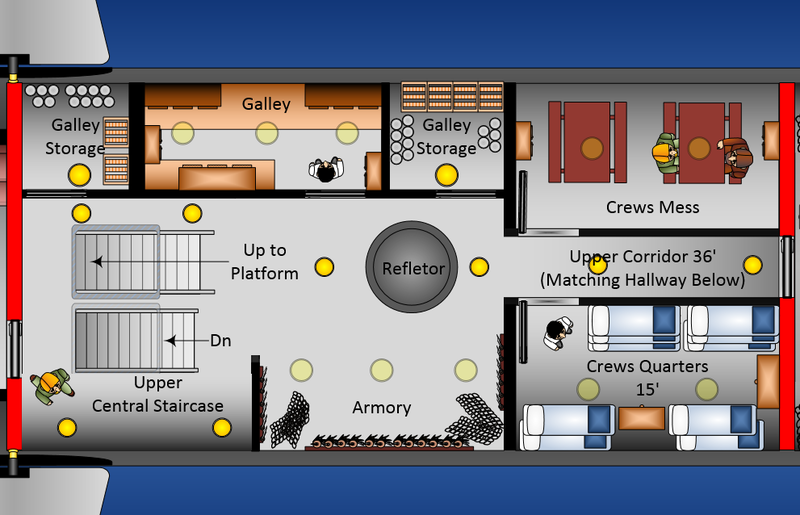 Also, the Galley would be better suited to the crews duties, if placed on the deck closest to the Aft Hatches. “I followed Captain Nemo through the waist ( used as the ‘Central Staircase’ this time) and arrived at the centre of the boat. Then a door opened into a galley nine feet long, situated between two large store-rooms. Near this kitchen was an adjoining bathroom. No reference to the placement of the WC, but it was a necessary compartment and may have been, as Europeans normally did, placed separate to the Bathroom. Both could either be on the left or right. I applied only the one central WC and adjoining Bathroom, unlike our friend Jean-Pierre, who included WCs in all living quarters. This I believe would be an extreme extravagance for a man like Nemo. By Verne’s narration, all these compartments were on the same deck level. This would not have been practical or even possible given the 239 foot length and narrow 26 foot beam. Also, all the rooms described to be on the lower level could not be located on the same side of a central corridor. Next to the kitchen was the berth-room, crew’s quarters per Walter James Miller translation (as in “upper berth”), Fifteen feet long (5 yards). This was at the End of the corridor followed by a door through a bulkhead to “machinery”. For what I thought an optimum arrangement, I placed the Crew’s Quarters and Galley on the same Upper Deck. This might make sense if the corridors are outboard and the various cabins located between them. However, and this seems critical to me, the ladders to the Dinghy and the Platform should be approximately amidships; too far to port or starboard and they’re so low on the curved hull to be underwater. Remember, the peak of the curved hull when surfaced is only 3 feet above the water line. This makes the visible hull surface only sixteen feet wide to the waters edge. Any hatch six feet off center of the boat would be awash when on the surface. I presumed the reference to “following the contours of the walls” in the Salon was due to the room narrowing forward, and angles of the raised forward doors to Nemo’s cabin and forward corridor. The corridor outside the cell has a ladder to the platform and the corridor they have returned to has the ladder to the dinghy, placing both inboard. ( Although no mention is made to left and right, the layout of the rooms seems to work best with a central corridor.) 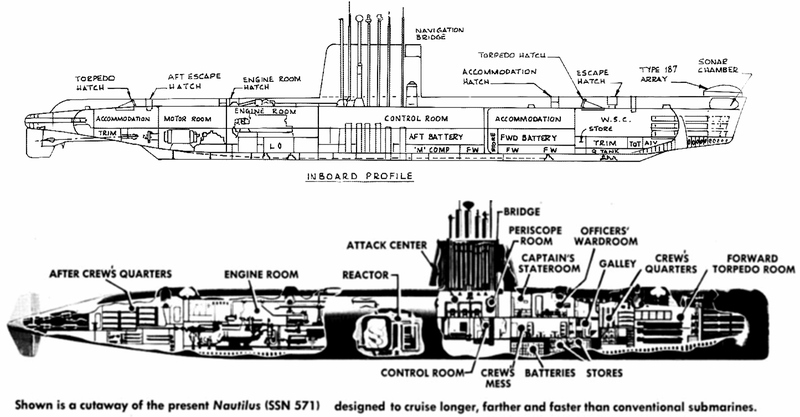 The hull curvature restriction is based on the repeated statements regarding the Nautilus having a cigar shape. This firmly makes it round and without ‘flat’ sections on the upper deck which would have permitted wide set access ports from exterior corridors on the inside, with port or starboard ladders. The recessed Platforms I applied were far too narrow to permit wide set hatches. My two aft hatches are located near enough amidships to clear the water line since set apart only one foot six inches. And each hatch opening being nearly four feet wide, this is sufficient for separating the two ladders by four feet. Hauling the catches down would not have been a severe undertaking. Ch 14: Aronnax: “I walked to the Central Companionway…” from the Salon. This means there simply could not have been sufficient space in the 26 foot width (beam) of the boat for both a central corridor as well as one on the port and starboard sides. 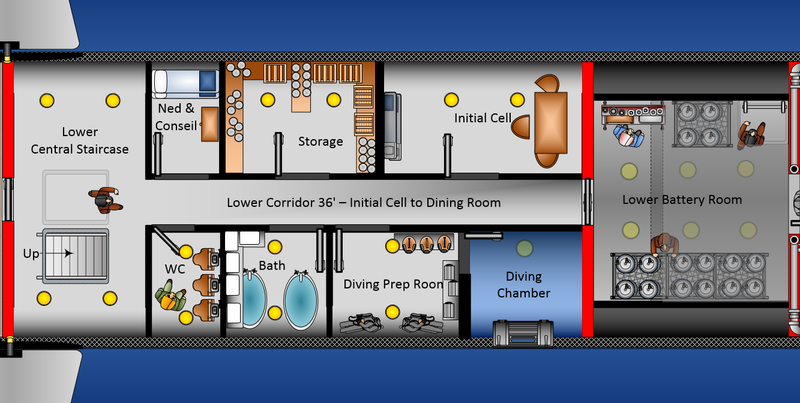 As mentioned earlier, allowing for two separate decks permits a reasonable arrangement of all the compartments as well as staying with the more traditional submarine construction practices. I think my space utilization, while staying within the constraints of Verne’s ship dimensions, has made for a comfortable, if slightly restricted environment. And it stays true to the historical limited space on submarines. See more below. Even now, we still have very cramped and similar quarters. But I think M. Verne would not only approve but be very impressed.